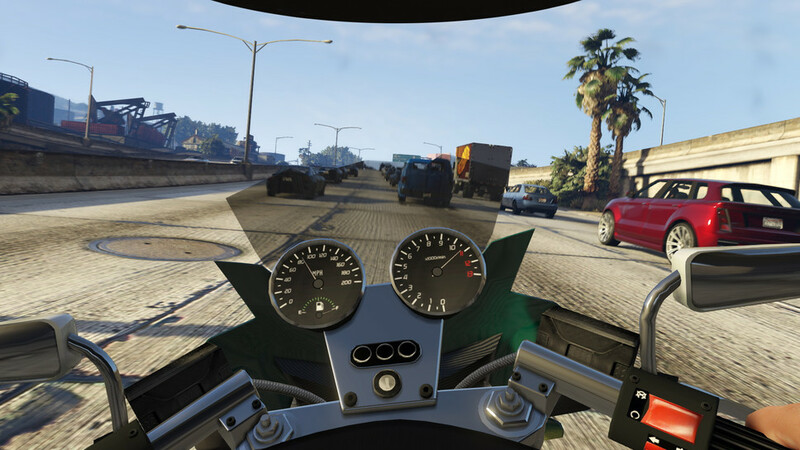 With more horsepower at its disposal, Rockstar Games has taken the dramatic step of implementing a first-person mode in Grand Theft Auto V on new-gen systems. James Cullinane went hands-on. It’s remarkable to think that it has been more than a year since Grand Theft Auto V slid into home base on Xbox 360 and PlayStation 3, just before our attentions were divided by a new generation of consoles. GTA V was the quintessential blockbuster experience on the last generation, a sprawling satirical epic that should fairly be considered one of the shrewdest parodies of Californian narcissism produced in recent years. Rockstar’s dogged decision not to rush out a “Grand Theft Auto V-and-a-half” around the new-gen launch window may have come as a disappointment to some, but the developer’s patience has resulted in what is unquestionably the definitive way to experience the game. The rumours were all true. Grand Theft Auto V for new-gen can be played in first-person, and it pulls you into Los Santos and Blaine County in a way the series has never done before. Achieving that new level of immersion in first-person mode has been a massive technical undertaking. 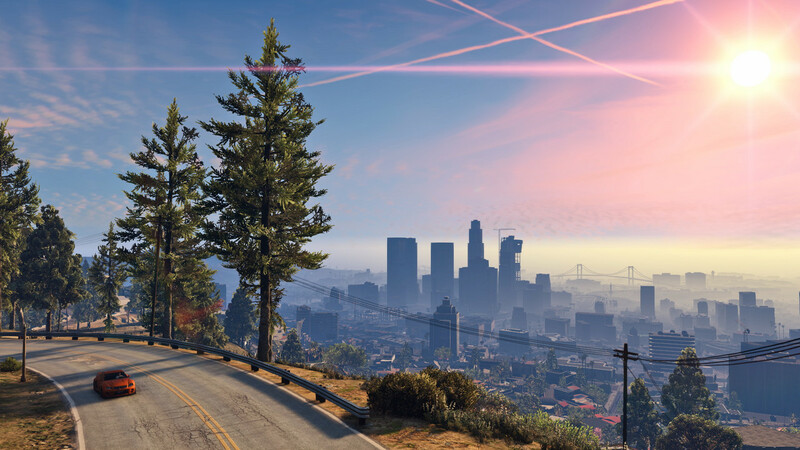 Every single texture in the game has been replaced, the draw distance has been increased, and GTA V for PlayStation 4 and Xbox One will run at 1080p, 30 frames per second. On PC, the game will even support 4K. The optional shift to first-person mode comes with a range of new systems and control options. Rockstar has developed a new first-person cover system, a new targeting system, and has implemented more traditional FPS controls including iron sights. In total, Rockstar has added more than 3000 new animations just for weapons. Switching between first- and third-person modes is bound to R3 (on PS4), just as it is in vehicles. There’s now also an extensive range of options that allow you to define how you wish the camera to behave. For example, if for whatever reason you’re a sucker for vertigo, you can insist that the camera remain in first-person through combat rolls or whenever your character ragdolls, say down a flight of stairs or over the hood of a car. Or you could let the game automatically snap out to third-person, and back in again once the animation is complete. That’s also possible with entering and exiting cover and cars, or when firing from cover. With a bit of tinkering for personal preference, it all comes together very tidily. When a coke deal goes bad on the Grove Street cul-de-sac, Trevor, Franklin, and Lamar must shoot their way out. The intensity goes way, way up in first-person mode, but automatically switching out to third person when in cover also provides hugely useful tactical perspective. 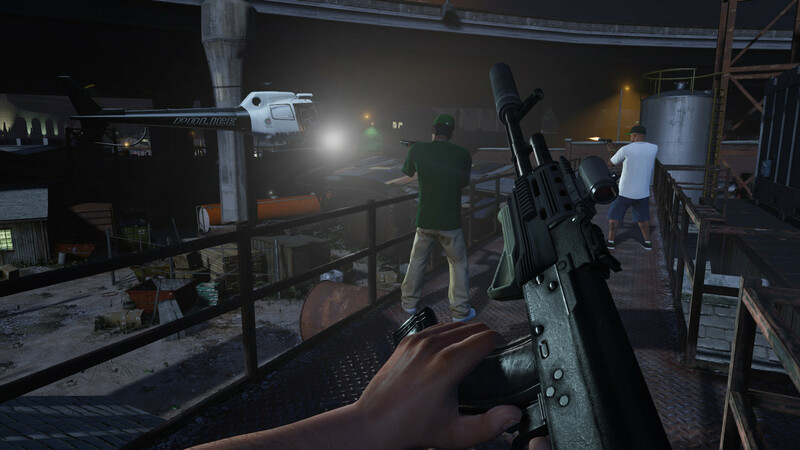 Meanwhile, instantly switching back into first-person mode when aiming means RPGs can be fired at the approaching gangstas’ low-riders with increased, uhh, precision. The interiors of all cars have been fully modelled to allow for first-person ‘cockpit’ views. These include working speedometers and petrol gauges, and functioning radios that display station and track information. While we’re on stations, more than 150 new tracks have been added to the game, plus new talk radio sessions and new commentary from returning DJs. A new first-person mode is of course a headline grabbing improvement, but what really makes a lasting impression are all the smaller touches that come to the fore in the game’s quieter beats. Head into the woods in Blaine County at night and you’ll see fireflies hovering above the forest floor. Fog now creeps out from swamps at dusk and clings low to the asphalt in the Vinewood hills at dawn. Rockstar has added a dynamically adaptive field of view, meaning you can control the point of focus in a way that more accurately models our own vision. There are now also three times the number of light sources, and added volumetric light pollution so that in heavy rain the headlights and neon signs of Vinewood seem to bleed out. In fact, literal bleeding out is more realistic now, too: water and other fluids pool better and behave more naturally. Other changes have added a substantial jolt of realism and a little challenge. Crowds are now thicker, and their models have been touched up to bear greater scrutiny in first-person mode. Traffic is also denser, and it’ll be interesting to learn whether this increases the difficulty of certain chase missions. Grass, shrubs, and other foliage makes going off-road – especially on foot – a much richer experience now. In the wild there are new kinds of animals, and their fur is textured to appear soft. These are just some of the smaller touches that together give new perspective, nuance and charm to an otherwise familiar setting. Some new missions and vehicles are intended to provide some additional incentive to returning players, but the real draw of Grand Theft Auto V for new-gen is a chance to sink into a more fully realised, more intricate and more arresting rendition of a game that has already defined one generation. In a year that has included more than a few disappointments, it might just end up defining the start of the new generation as well. ◆ Grand Theft Auto V releases on PlayStation 4 and Xbox One on November 18, and on PC on January 27.